When it comes to buying an acoustic guitar, determining which is the “best” is hard to pin down. Any player—from beginners to seasoned artists—are going to prefer different qualities in their instrument. Small variations, like the feel of the frets or a slightly bright tone, can be the difference between falling in love with an acoustic guitar or looking elsewhere. With that said, there are some key qualities to look for if you’re in the market for a new axe. Body style is perhaps the first thing to consider when narrowing down your options. Different body styles produce different sound qualities. However, you need to find the body style that fits comfortably with your body. A six-foot guy who’s built like a linebacker and a petite woman with small hands will probably need guitars of different body styles. Body style is especially key if you’re buying an acoustic guitar for your kids: starting them on something too big may lead to early frustration. The most common body styles are jumbo, dreadnought, auditorium, and concert (the latter two come in standard and “grand” varieties). There are are also “mini,” scaled-down guitars that work great for travel or as a learning guitar for kids.Though some guitarists prefer the sound of one body style over another, comfort and ease of play are more important to others. Some acoustic guitars feature solid tops with synthetic sides and neck. Others are made entirely of wood. The type of wood an acoustic guitar is made from may yield different sound qualities or work better for different styles of playing. For instance, spruce is resilient and stands up to hard strumming. Rosewood is rare and highly prized for the rich tone it lends to a guitar’s sound. You might also choose an acoustic guitar made of all synthetic material like fiberglass or graphite. These materials aren’t as susceptible to the weather, so might be the best option if you do a lot of outdoor gigs. I once played an all-wood guitar for an outdoor concert when it was 40 degrees and raining; she was never the same after that. On the other hand, the sound quality of synthetic guitars doesn’t improve with time. Regardless of the material of the acoustic guitar you buy, you should check out the action, or distance between the fingerboard and the strings. The first thing to check is how the guitar feels under your fingers. You should be able to press the strings to the fingerboard with no trouble. If you’re a beginner, you’ll eventually build up callouses to make this more comfortable. Next, get eye-level with the neck of the guitar and find the 12th fret. A good general test is to look at the action down the length of the neck between the 12th and 5th frets. The distance between the fingerboard and strings should be consistent. If you want to get really nitty-gritty, you can use a ruler to confirm. Any change in action might indicate a bowing of the neck or other structural issues. If you really love the guitar, you could see a luthier about getting this fixed. If you’re not enamored, it might be better to look for another instrument. Sound is incredibly subjective. Some guitarists love a big, booming bass. Others look for subtle, airy reverberation. 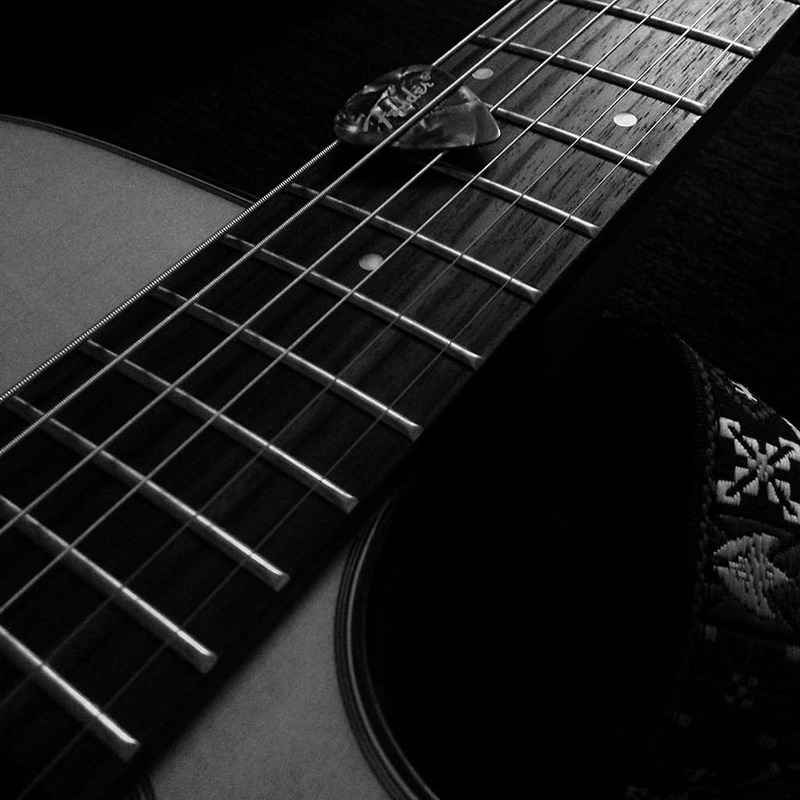 The most important thing is that you like the sound your acoustic guitar makes. However, every acoustic guitar should have proper intonation. An experienced player can check intonation by playing a chord and then comparing it to the same chord at the 14th fret. A method for beginners—which some pros prefer anyway—is to check the harmonics at the 12th fret. Pluck an open string. Then, place your finger lightly on the string at the 12th fret. Don’t press down all the way. Pluck the string again. The sound of the open string and the 12th fret harmonic should be exactly the same. If you’re not sure you have the “ear” to test intonation, ask a friend who is an experienced musician to help you. It doesn’t matter if your friend plays the guitar or not; a practiced musician should be able to judge pitches on any instrument. If you need a little more guidance with checking intonation using harmonics, check out this quick video. Newbie and experienced musicians alike love the Epiphone DR 100. This acoustic guitar features a mahogany neck, rosewood fingerboard, and resilient spruce top. There are three classic finishes to pick from: natural, ebony, or “vintage sunburst” if heavier varnishes are your style. Experienced players have compared the balanced sound of the DR 100 to some all-wood guitars made by Epiphone. Even though the DR 100 is full-size, it is light, sturdy, and travels well. Parents who bought one for the kids confirm that this guitar may be a good match for clumsy new learners. One consistent downside that people seem to notice is the sharp frets. A few people also reported that this Epiphone model needs frequent tuning. Furthermore, the tuning mechanisms of the guitar may not be able to hold up to this heavy use. There seem to be a lot of people online looking for repairs and replacements. I may have a personal soft spot for this one; it reminds me of the Fender dreadnought I learned to play on. Personal bias aside, the Fender FA-100 seems to be an all-around crowd-pleaser, especially amongst beginners. This acoustic guitar features a compensated bone saddle, which helps produce a clear tone from each string. Both beginning and experienced musicians also love the shiny finish which some say really glows under stage lights. The top of the FA-100 is laminate spruce, not the pure hardwood. Some players found the sound a little flat as a result. Out of the box, this Fender also has fairly high action. This may not be a problem for people who know how to adjust a guitar’s action but may prove an obstacle for beginners. Finally, some musicians reported that the guitar developed some buzzing and intonation problems. Again, this probably isn’t so bad if you know how to fix these issues as they arise. If you don't, this might be a deal-breaker. Another dreadnought, laminate spruce top acoustic guitar, the Jasmine S34C NEX is designed to have a clear, bright sound. The source of this sound is Jasmine’s unique forward-shifted X-bracing. Jasmine says that by placing the X-brace closer to the sound hole, the top of the guitar vibrates more freely and produces super sharp sound. Customers seem to agree. Unlike the Fender, which seems to skew toward beginners, experienced players like the sound and easy action of the Jasmine S34C. The neck of this guitar is slightly thinner than average, making it easier to play for people with smaller hands. The neck wasn't so thin, however, that it presented problems for others. The biggest issue that some people seemed to have with the Jasmine S34C was the quality of the tuning pegs. Keeping the guitar in tune may be a challenge, and some customers reported the tuning pegs broke after a short period of time or were fitted improperly to begin with. Besides the tuning pegs, you’ll also want to take care with the guitar’s finish. The body and headstock are both susceptible to chipping and dents. Finally, for those wanting to rock out right away, keep an extra pair of strings on hand when you buy your Jasmine. The included strings tend to break on the first tune. Some found them completely unplayable. The Yamaha FG800 has a solid spruce top. Its body is made from a combination of mahogany and nato woods. Yamaha 800 series guitars also feature unique scalloped bracing inside the body to improve sound quality without compromising the structural integrity of the guitar. The FG800 is loved by beginners who find it easy to play. However, this is not only a beginner’s acoustic guitar. Experienced players like the depth of sound created by the solid spruce top, and the loud volume they can crank out of the relatively small dreadnought body style. There’s not much that customers found amiss with this Yamaha. A few noticed a buzz on the lower strings early on, but a string change took care of the problem. A quick note for the uninitiated: the stock strings that come with a new acoustic guitar usually aren’t the best. Plan to change them out early. Some guitarists also found the finish on the neck to be a little too thin and scratchy. Frequently play may or may not smooth it down. Sanding any part of a guitar is a delicate process; if you go that route, be sure you know what you're doing or get someone who does to help. Finally, like many new guitars, the action on the Yamaha might be a little high for your preference at first and may require adjustment. The body and top of the Rogue RA-090 acoustic guitar are made from laminate whitewood. The fretboard is “imitation” rosewood, but that doesn’t seem to bother anyone once they hear how this guitar sounds. Rogue markets this as a starter guitar, but some advanced players say they have a hard time putting it down. With some simple set-up—namely, higher quality strings—the Rogue RA-090 produces sound that pleases everybody. This Rogue model is also light, travels well, and makes a good gig guitar. Most customers are also pleasantly surprised at how nice the guitar looks. The natural and sunburst finishes are particularly popular. As for some cons, there are some reported issues with the frets: chipping paint, sharpness, or rusting. Some players also have difficulty keeping the Rogue RA-090 in tune, particularly at first. If this is an issue, you might want to tune the guitar in increments, gradually stretching the strings before you attempt to play. Finally, there are a lot of stories of guitars arriving cracked and banged up. This seems to be an issue with improper packing and shipping practices, not necessarily a problem with the guitar itself. If you buy an RA-090 and have it shipped to you, read the return policy and check the guitar for damage upon arrival. From our lineup of solid choices, the acoustic guitar we think musicians would be happiest with is the Yamaha FG800. The FG800 is a favorite both for beginners and experienced players, a versatile acoustic guitar that combines ease of play with big volume and complex sound. The laminate top guitars on this list--good options especially for beginners--can't quite match the reverberation of the Yamaha's solid spruce top. Compared to the other solid top guitar on this list, the Epiphone DR 100, the Yamaha stands apart for its workmanship and quality. Some issues with frets and tuning were reported with the Epiphone, but Yamaha customers had few complaints about the guitar's make and durability. Like with any acoustic guitar you buy, you will have to set up the Yamaha FG800 to your preference by restringing or adjusting the action. True guitar enthusiasts won't see this as a drawback, however. Rather, it's an opportunity to get a unique sound and style from your instrument.